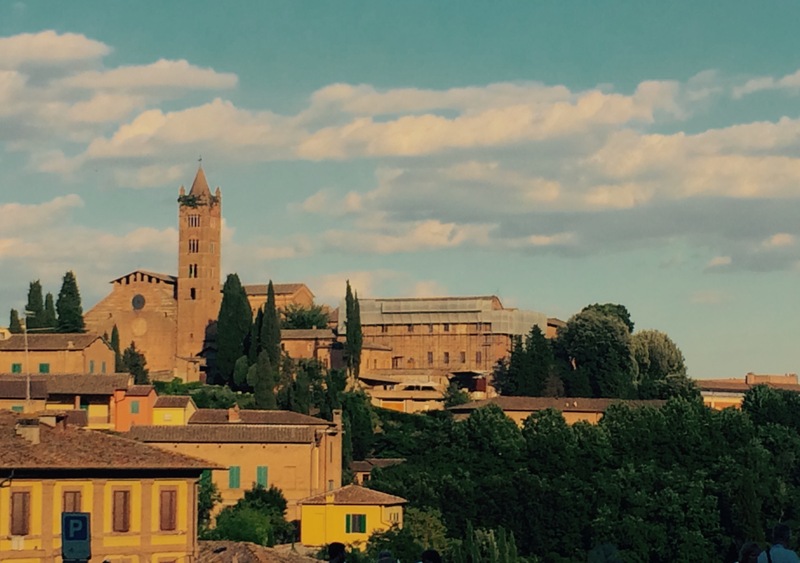 Got into Siena earlier this evening. At 11 am, I saw Marina off on her way back to LA and headed to catch my train north. The Termini train station in Rome was a mess, you couldn’t get straight answers about the train or the platform from the normal channels without waiting in line for 30+ minutes. As a result there are lots of pretend helpers giving wrong info in broken English so they can get a couple of Euros off you. One young lady was going to send me off on the entirely wrong train and got offended that I didn’t tip her enough. Luckily I found a person working for the train company who knew the real answers to my questions about rail connections. 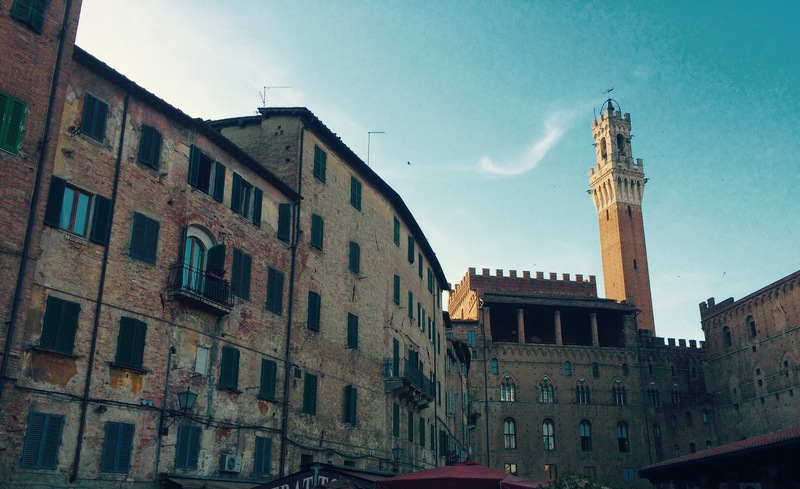 But here I am now sitting at a restaurant in the delightful medieval town of Siena. The sun has almost set and not surprisingly, the massive town square has a “Burnt Siena” look to it. In typical Italian style, the square becomes a place to meet and talk in the evening. 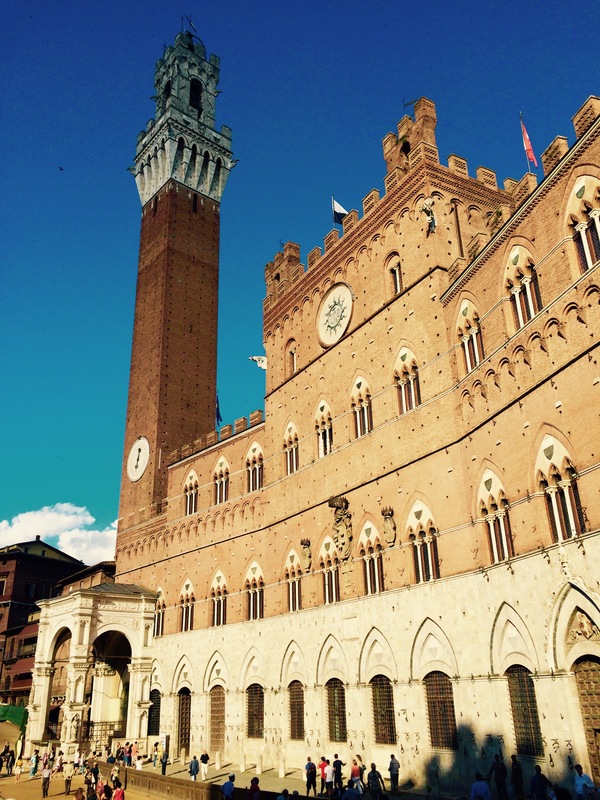 And the Siena square, probably the largest in Italy, is famous for it’s playful mood. Thankfully, there are none of the aggressive sellers of selfie-sticks and fake brand name handbags you find at squares in Rome and Venice. I’m at Trattoria Papei in this phone pic at a campo just behind the main square, watching the other diners eat as I toil over my phone keyboard. I just finished a lovely peasant veggie stew, fantastico! Next course, pheasant with raisins and pine nuts. It had a dark flavor — almost like venison — and was so thickly dense, it was hard to tell where the bird ended and the sauce began. Tuscan cooking at its best. But then Siena is the gateway drug for Tuscany. More earthy style than Milan, as much history in its twisted streets as Florence. And none of the noise and grit of Rome. This is the real Italy. And you almost don’t feel like a sweaty tourist. Almost. It’s like, yeah, I could buy a little Tuscan villa, maybe a fixer upper, hang out with beautiful Italians and no one would notice that I’m not George Clooney. Naw. Tuscany calling, can you accept the charges?